HDR-300 LED video ring light [SHD-LIT-005] - €5.00 : Shadeena Rentals - The more you rent, the less you spend! The HDR-300 features 300 daylight-balanced LEDs which produce 1950 Lux @ 1-meter. With this output, the ring light is equivalent in power to a conventional 1x1 light panel. It features variable dimming, two power options, as well as snap-on, magnetic filters. The HDR-300 also comes packaged with an L-bracket and a 15mm Rod Mount. The L-bracket has a 1/4"-20 thumb screw that allows you to mount your camera for mobile use with the HDR-300 system. The bracket also has a 5/8" female receptacle, allowing you to mount the light directly onto a light stand if desired. The 5/8" female receptacle can also accept a hand grip to allow for a mobile, compact shooting solution. The 15mm Rod Mount allows you to mount the HDR-300 directly on to your standard 15mm rod set-up. It has several mounting options. 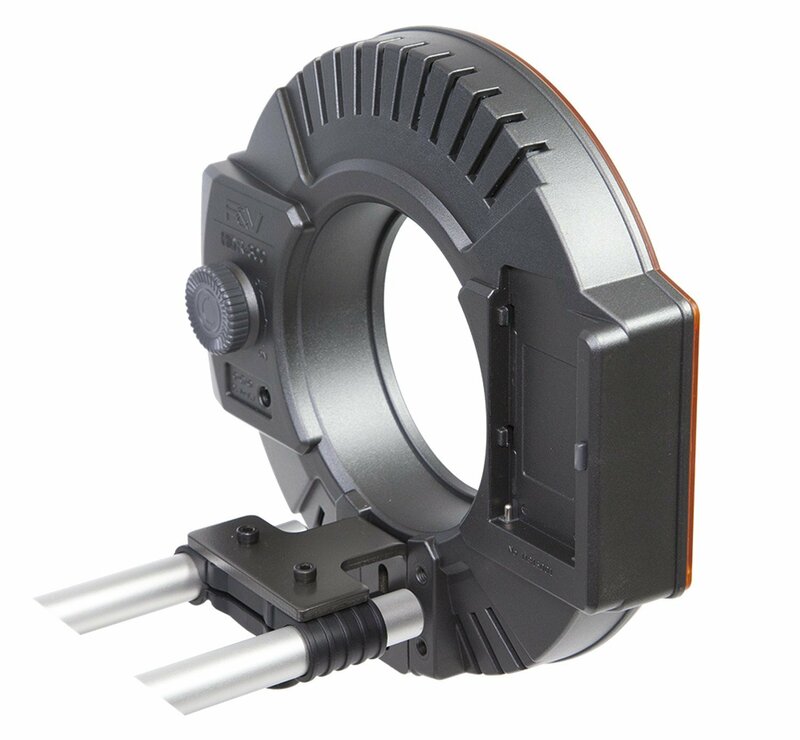 Several mounting threads allow for compatibility with the L-bracket as well as a 15mm Rod Mount system. The HDR-300 can also be mounted on top of your camera; it has a 1/4"-20 thread-in on its underside for use with a ball head.